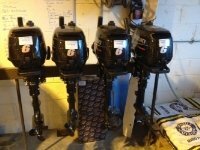 We are the authorised Irish Agents of numerous, quality boat engine manufacturers. We supply our customers with various parts and oils from these manufacturers. Our qualified team of boating mechanics supply, service and repair boat engines manufactured by Suzuki and Tohatsu. We are so confident in the quality and professionalism of our service that we offer a guarantee on all parts and servicing of Suzuki and Tohatsu outboard engines. For more details on the repairs and servicing, we provide to Suzuki and Tohatsu outboard engines or to receive a quotation for the work, contact us today on 074 9560011.